In celebration of Black History Month, the Recorded Sound Archives has curated a collection of African-American artists. Discover the voices of Huddie Leadbelly, Billie Holiday, Ethel Waters, Fats Waller and more in this collection! Over 20 artists for you to discover and listen to. Follow us on Facebook and learn some fun facts all this month about these artists and they’re contributions to music. Photo of Xavier Cugat. This work is from the William P. Gottlieb collection at the Library of Congress. As part of Hispanic / Latino Heritage month, we’d like to take the opportunity to introduce you to some important artists who shaped the world of Latin music into what it is today. Today we would like to highlight Xavier Cugat. Born January 1, 1900 in Catalonia, Spain, his family had bigger plans venturing first to Cuba when he was five. In Cuba, this is where Xavier picked up the violin training as a classical violinist he went on to play with the Orchestra of the Teatro Nacional in Havana. Xavier trained further in Paris and Berlin and in 1915, his family boarded the SS Havana en route to New York City where Cugat went on to train before serving five years as a violinist appearing in recitals with Erinco Caruso. Cugat went on to lead the resident orchestra at the Waldorf-Astoria before and after World War II before venturing out west to Los Angeles. Here are 3 interesting facts about Xavier Cugat, you may or may not know about him. 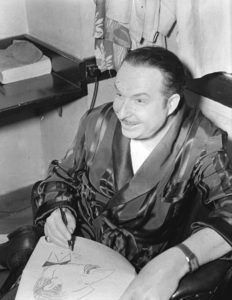 Three interesting facts about Xavier Cugat! 1. He was a classically trained violinist who conducted with his bow, and can be seen in quite a few films waving his violin bow. Below is an animated gif showcasing Xavier Cugat in Stage Door Canteen waving his bow as he conducts his orchestra. You can watch the clip below from Stage Door Canteen, 1943 where Xavier Cugat can be seen conducting with his bow at 1:16. 2. Xavier was known as the Rhumba King and is credited with pushing Latino music and dance into popularity and best-known for having popularized the rumba in the United States during the 1930s. He and his band, the Gigolos, were featured in several popular Hollywood movies in the 1940s and 1950s. They introduced many popular Latin American rhythms to North American audiences and toured extensively every year, playing tangos, rumbas and congas. “Under the influence of tropical skies and a couple of daiquiris, people developed a taste for my Latin American style of music,” he once said. 3. Xavier went on to work for the Los Angeles Times as a cartoonist. Not a huge stretch, considering art seemed to run in the family. His older brother Francis Cugat worked as a portrait, poster, book jacket artist and set designer. He is known for his 1925 cover of The Great Gatsby by F. Scott Fitzgerald. Cugat himself can be seen in a few films drawing his caricatures prior to or during a performance. Here at the Recorded Sound Archives, we have over 30 recordings by Cugat and several of this bands. To listen to more music by Cugat, click here. 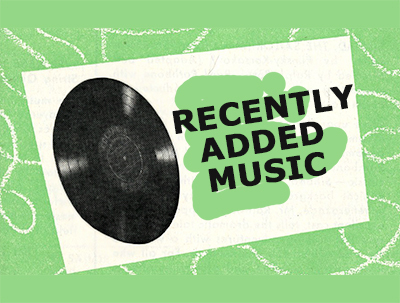 In celebration of Hispanic / Latino Heritage month, we have digitized over 180 Latin American recordings for you to listen to. Click here to view collection. Please note, due to copyright some items may only be available as a 45 second snippet. If you are a Researcher or Educator in need of full access to these recordings, click here. Below you’ll find a list of recordings that were recently added to the Research Station this Summer 2018 from requests made by Research Station Users. 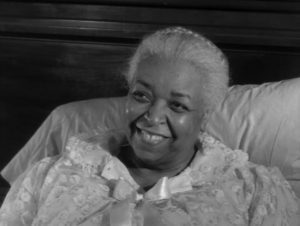 In the episode, “Good Night, Swee Blues”, Ethel Waters plays Jenny Henderson, a retired singer in failing health who commissions Tod and Buzz to find and bring her the members of the Memphis Naturals, the band she performed and recorded with thirty years earlier. Waters’ nomination for this role paved the way for women like Diahann Carroll, Cicely Tyson, Alfre Woodard, Halle Berry, Kerry Washington, Regina King, and Viola Davis, now the first Black woman to win the Emmy for Outstanding Lead Actress in a Drama Series. Beyond acting, Waters’ also performed jazz, big band, and pop music on the Broadway stage and in concerts, although she began her career in the 1920s singing blues. Here at the Recorded Sound Archives we are celebrating Black History month through music by highlighting the voices of the past and their accomplishments. To listen to recordings by Ethel Waters, click here. Two weeks after his 101th birthday, pianist and composer Irving Fields passed away August 20, 2016 in Manhattan. He was perhaps the longest working musician in the world. 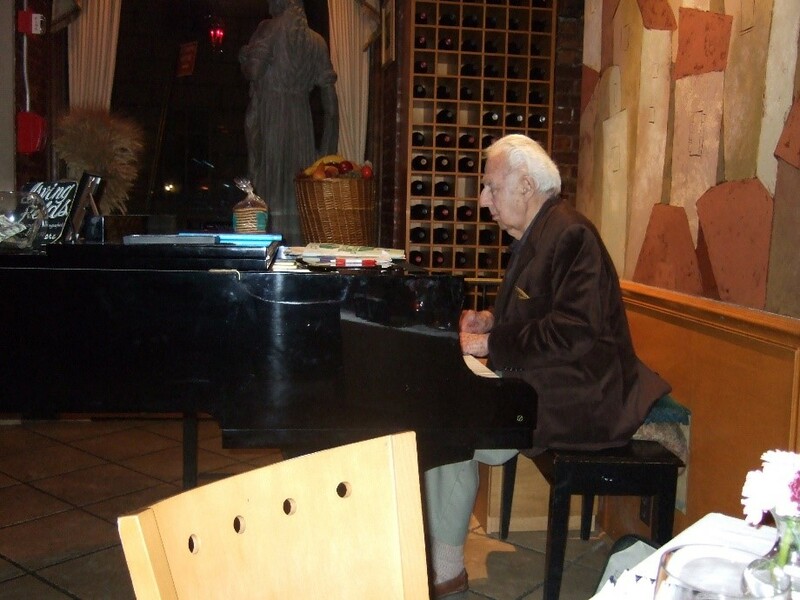 At the age of hundred, he used to play the piano several nights a week at Nino’s Tuscany restaurant in Manhattan. Irving Fields became known by fusing Jewish tunes, jazz, and popular songs with Latin music. Born as Isidore Schwartz in 1915 New York City to Jewish immigrants, Irving Fields started working as a pianist in the thirties during the years of the Great Depression. In this time of high unemployment, he started playing piano in resort hotels in the Catskills Mountains, and then he found work as a pianist on cruise ships sailing from New York to Havana, capital city of Cuba. In Havana, Irving Fields listened to the great Cuban orchestras, and developed his love for Latin music. Attracted by pictures from palm trees and beaches in travel magazines, Irving decided to settle in Miami Beach and performed in hotels playing dinner music, and did sessions with local orchestras. After joining the army, he began the Irving Fields Trio, with a bass and a drummer, and started composing his own songs. In 1947, his song Miami Beach Rhumba became a big success by versions of Kay Kyser, Freddy Martin, Carmen Miranda, and even by the popular band leader Xavier Cugat. During the Latin craze trend in the 40s, Irving Fields was at the right time and place, and soon Miami Beach Rhumba was followed by the number one hit song Managua, Nicaragua (1947) recorded by big band leader Guy Lombardo, and ten years later by Chantez-Chantez (1957) by singer Dinah Shore. 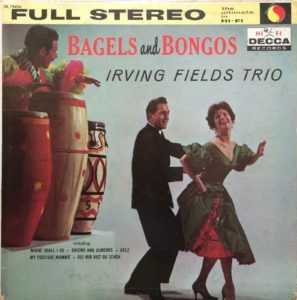 In 1959, the Irving Fields Trio recorded the album Bagels and Bongos blending popular Jewish tunes with Latin rhythms such as Bei Mir Bist Du Schön as a mambo, Havannah Negila a paso doble, and I Love You Much Too Much a rhumba. The album became a big hit all over the world, and was followed by the albums More Bagels and Bongos (1960), Pizzas and Bongos (Italian traditionals), Champagne and Bongos (with French standards), and Bikinis and Bongos (with Hawaiian music). Every song was mixed with a Latin beat, which turned out to be a story of success. After the success with his trio in the sixties, Irving Fields went back working as a solo pianist on cruise ships again, where he sailed the whole world, and finally settled as a music entertainer in restaurants, from 2004 six nights a week in Nino’s Tuscany, Manhattan. This would become the place, where he started his second career. In the last decade, several films appeared about Fields playing piano on YouTube. These films form a good impression of his talent, wisdom, and humor. Although Irving Fields was not a user of a computer or the Internet, he did compose the YouTube theme song. Regarding my research about the influence of Jewish tunes in American popular song, I contacted Irving Fields, and then I received several handwritten letters from him. 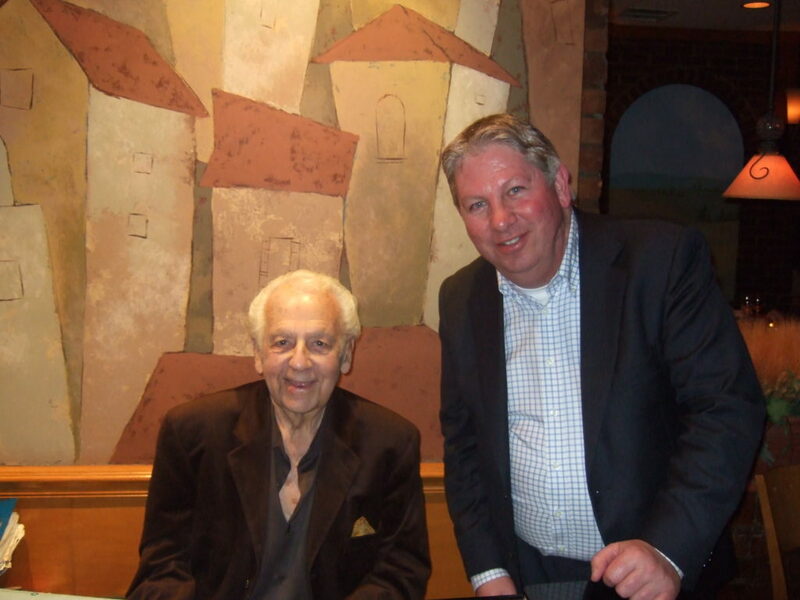 At my birthday March 2010, I met Irving Fields and his lovely wife Ruth in person in Nino’s Tuscany restaurant, where he entertained the guests with his music. From my letters, he knew that I should visit him this special evening. To my surprise, he welcomed me with a newly composed personal anniversary song. When listening to his music and talking to him, I knew that I was close to one of the last persons, already in his nineties, who could tell me first-hand about the history of popular music in the Tin Pan Alley period before the second World War. Of course, I also asked him about his secret for longevity, and he replied with more than ten rules. The first three rules for longevity are; (1) Have a sense of humor (you’ll never get ulcers), (2) Think of these three magic letters before you make a decision: L.T.D. Look, Think and Do, and (3) Be the first to say “hello” with a smile on your face and a friendly glow. Following these rules during his life, Irving Fields became ultimately 101 years young. You can listen to over 30 recordings by Irving Fields on the Recorded Sound Archives website by clicking here. RSA Guest Blogger, Niels Falch, is a PhD candidate at the University of Groningen in the Netherlands and is currently writing a dissertation on the influence of Jewish music in American popular songs. 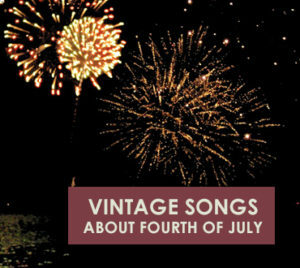 Celebrate this Fourth of July by listening and discovering some vintage songs from the early 1900s. Listen to a funny monologue and learn how the Fourth of July was celebrated at the Pun’kin Center back in 1915 or learn more about the Declaration of Independence, Thomas Jefferson and other Americana. Below you will find a list of 5 songs and albums for you to share and enjoy this year with family and friends. 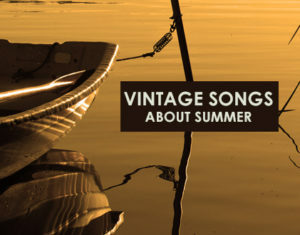 Celebrate this Summer by listening and discovering some vintage songs from the early 1900s about summer and/or the summertime. Below you will find a list of over 20 songs for you to share and enjoy this year with family and friends. 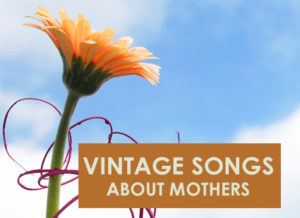 Celebrate this Mothers Day by listening and discovering some vintage songs from the early 1900s about mothers. There’s even a song or two about Dad and a fun Monologue called How Mother Made Soup for your enjoyment. Below you will find a list of over 20 songs for you to share and enjoy this year with family and friends. While digitizing recordings by Sergei Rachmaninoff at the Recorded Sound Archives, we found some interesting facts about Rachmaninoff that you may not of known. Such as did you know…. 1. Rachmaninoff was twice offered the position of conductor at the Boston Symphony Orchestra. He refused both times. 2. Aside from being a magnificent composer, Rachmaninoff was also a man of strong moral character. 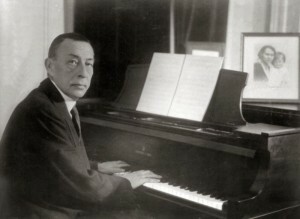 In 1912, Rachmaninoff resigned from his position as vice-president of the Russian Musical Society in protest to a musician being dismissed from his duties because he was Jewish. 3. Rachmaninoff’s last piano recital included Chopin’s Sonata no. 2, which includes a famous funeral march. Rachmaninoff died 40 days after performing the funeral march. Rachmaninoff’s composition All Night Vigil was sung at his funeral. Want to learn more about Sergei Rachmaninoff and his music? Click here to listen to over 40 recordings that have been digitized and learn more about the life of Sergei Rachmaninoff.